An epiretinal membrane is a condition where a very thin layer of scar tissue forms on the surface of the retina in an area that is responsible for our sharpest vision. The part of the eye affected by an epiretinal membrane is called the macula. The macula is made up of special nerve cells that provide our sharp central vision needed for seeing fine detail (reading and driving etc.). When an epiretinal membrane forms over the macula, it may contract and wrinkle the macula resulting in distorted and/or blurred vision. In most cases the development of an epiretinal membrane appears to be related to normal age related changes inside the eye. In some cases it can be related to conditions such as diabetes, retinal tears, blockage of blood vessel, inflammation or prior eye surgery. Epiretinal membranes are not related to macular degeneration. Epiretinal membranes can but often do not usually affect the other eye. They are quite common and affect up to 10% of people in later years (60 years or older). We are able to detect an epiretinal membrane during an eye examination. Sometimes, a special scan of the back of the eye (Optical Coherence Tomography) may be needed to confirm the presence of an epiretinal membrane. Your surgeon will assess your symptoms to help you decide whether you may benefit from surgery. The main symptoms that we look for when deciding to recommend surgery are blurring and distortion of vision that are interfering with your day-to-day activities. If your symptoms are significant you may want to consider surgery to help maximize the vision in your affect eye. Surgery is the only way to treat an epiretinal membrane, there are no eye drops or medications that you can take that will help. Although a majority of our patients experience an improvement in vision after surgery, there are a small percentage that do not have improved vision even after successful and uncomplicated surgery. Often, if a patient does not have an improvement in the level of their vision (visual acuity), they will often have an improvement of the distortion they where experiencing prior to surgery. Patients that do not have a significant improvement in vision after surgery often have had their epiretinal membrane for a longer period of time. You need to keep in mind that our goal is to maximize the vision in your affected eye. Even after successful surgery, your vision will likely never be as good as it was prior to the onset of your symptoms. • 1 in 1000 risk of infection (endophthalmitis). Anytime surgery is performed on the eye infection is a possible complication. Sterile technique is used during the procedure to minimize risk of infection. Despite this, there is a very small chance that an infection can occur. If such an infection does occur it can be treated, although it may leave you with worse vision or in severe cases lead to blindness. • 1 in 1000 risk of bleeding. Anytime surgery is performed on the eye bleeding is a possible complication. This can occur in or around the eye and lead to permanent vision loss. We will review any medications you are taking prior to surgery to ensure you are not taking any blood thinners that can increase your risk of bleeding. • 5% risk of retinal tear or detachment. Anytime vitrectomy surgery is performed there is a small chance of developing a tear in the retina which can lead to a detachment during or after surgery. We will carefully examine your eye at the end of surgery to ensure you have no retinal tears. If you do have a retinal tear we will treat it at that time with laser treatment. • Progression of cataract. If you have not yet had cataract surgery, having vitrectomy surgery will accelerate progression of cataract in that eye. Although not always the case, you can expect to need cataract surgery within a year of vitrectomy surgery in the operated eye. Epiretinal membrane surgery involves a vitrectomy and membrane peeling. We use the most advanced surgical equipment and techniques available for epiretinal membrane surgery. The surgery involves making 3 holes in the eye and using instruments to remove the jelly-like substance that normally fills the center of the eye, called the vitreous humor (vitrectomy). The removal of the vitreous inside the eye does not cause any permanent harm. 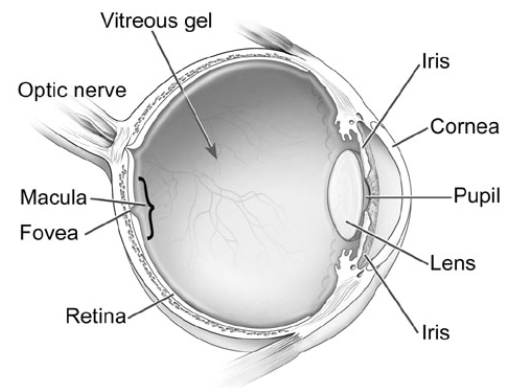 The vitreous is replaced by natural fluid produced inside the eye. The membrane is then physically peeled off the retina with a fine forceps (membrane peeling). A small air bubble is left in the eye at the end of the surgery to help with healing of the wounds. You may notice this as a small shadow in the bottom of your vision that may move around. This bubble will disappear within 1 week. The holes made in your eye are made in a fashion that allow them to close and heal on their own; usually no stitches are needed to close them. The surgery usually takes less than one hour to perform. It is typically done under local anesthesia so that you are awake and comfortable during the procedure and have minimal complications from anesthesia postoperatively. If you are awake, it is very important for you stay still during surgery. After the surgery you will have an eye shield placed on your eye. Do not remove this shield until we see you in the clinic the following day when we will remove it for you. You will be given instructions on which eye drops to use and all your restrictions at this time. You do not need to use any eye drops the night after surgery. Please bring all your eye drops to your first postoperative visit. Most patients have minimal discomfort after surgery. If you have some pain we recommend you take Acetaminophen (Tylenol). Avoid Aspirin or Ibuprofen as this can increase your risk of bleeding. Following epiretinal membrane removal, the vision is typically more blurred and will gradually improve as the eye and retina heal. Vision can gradually improve up to 3-6 months following surgery. If you have any questions or concerns regarding this or any other information please call our office at 614-464-3937.